Also known as James the Less. James, the son of Zebedee -- Apostle, brother of John, Apostle; also called "James the Greater". James, the son of Alpheus, Apostle -- Matthew 10:3; Mark 3:18; Luke 6:15; Acts 1:13. James, the brother of the Lord -- Matthew 13:55; Mark 6:3; Galatians 1:19. Without a shadow of doubt, he must be identified with the James of Galatians 2:2 and 2:9; Acts 12:17, 15:13 sqq. and 21:18; and 1 Corinthians 15:7. James, the son of Mary, brother of Joseph (or Joses) -- Mark 15:40 (where he is called � mikros "the little", not the "less", as in the D.V., nor the "lesser"); Matthew 27:56. Probably the son of Cleophas or Clopas (John 19:25) where "Maria Cleoph�" is generally translated "Mary the wife of Cleophas", as married women are commonly distinguished by the addition of their husband's name. James, the brother of Jude -- Jude 1:1. Most Catholic commentators identify Jude with the "Judas Jacobi", the "brother of James" (Luke 6:16; Acts 1:13), called thus because his brother James was better known than himself in the primitive Church. 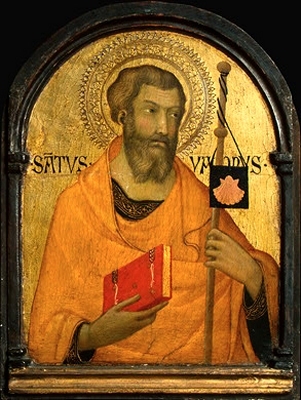 The identity of the Apostle James (2), the son of Alpheus and James (3), the brother of the Lord and Bishop of the Church of Jerusalem (Acts 15, 21), although contested by many critics and, perhaps, not quite beyond doubt, is at least most highly probable, and by far the greater number of Catholic interpreters is considered as certain (see BRETHREN OF THE LORD, where the chief argument, taken from Galatians 1:19, in favour of the Apostleship of St. James the brother of the Lord, is to be found). The objection moved by Mader (Biblische Zeitschrift, 1908, p. 393 sqq.) against the common statement that "Apostles" in Galatians 1:19 is to be taken strictly in the sense of the "Twelve" has been strongly impugned by Steinmann (Der Katholik, 1909, p. 207 sqq.). The James (5) of Jude 1:1 must certainly be identified with James (3), the brother of the Lord and the Bishop of Jerusalem. The identification of James (3), the brother of the Lord and James (4), the son of Mary, and probably of Cleophas or Clopas offers some difficulty. This identification requires the identity of Mary, the mother of James (Matthew 27:56; Mark 15:40), with Mary the wife of Cleophas (John 19:25), and, consequently, the identity of Alpheus (2) and Clopas (4). As Clopas and Alpheus are probably not two different transcriptions of the same Aramaic name Halpai (see CLEOPHAS), it must be admitted that two different names have been borne by one man. Indeed, there are several examples of the use of two names (a Hebrew and a Greek or Latin name) to designate the same person (Simon-Petrus; Saulus-Paulus), so that the identity of Alpheus and Cleophas is by no means improbable. On the whole, although there is no full evidence for the identity of James (2), the son of Alpheus, and James (3), the brother of the Lord, and James (4), the son of Mary of Clopas, the view that one and the same person is described in the New Testament in these three different ways, is by far the most probable. There is, at any rate, very good ground (Galatians 1:19, 2:9, 2:12) for believing that the Apostle James, the son of Alpheus is the same person as James, the brother of the Lord, the well-known Bishop of Jerusalem of the Acts. As to the nature of the relationship which the name "brother of the Lord" is intended to express, see BRETHREN OF THE LORD. Had we not identified James, the son of Alpheus with the brother of the Lord, we should only know his name and his Apostleship. But the identity once admitted, we must consequently apply to him all the particulars supplied by the books of the New Testament. We may venture to assert that the training of James (and his brother Jude), had been that which prevailed in all pious Jewish homes and that it was therefore based on the knowledge of the Holy Scripture and the rigorous observance of the Law. Many facts point to the diffusion of the Greek language and culture throughout Judea and Galilee, as early as the first century B.C. ; we may suppose that the Apostles, at least most of them, read and spoke Greek as well as Aramaic, from their childhood. James was called to the Apostolate with his brother Jude; in all the four lists of the Apostles, he stands at the head of the third group (Matthew 10:3; Mark 3:18; Luke 6:16; Acts 1:13). Of James individually we hear no more until after the Resurrection. St. Paul (1 Corinthians 15:5-7) mentions that the Lord appeared to him before the Ascension. Then we lose sight of James till St. Paul, three years after his conversion (A.D. 37), went up to Jerusalem. Of the Twelve Apostles he saw only Peter and James the brother of the Lord (Galatians 1:19; Acts 9:27). When in the year 44 Peter escaped from prison, he desired that news of his release might be carried to James who held already a marked preeminence in the Church of Jerusalem (Acts 12:17). In the Council of Jerusalem (A.D. 51) he gives his sentence after St. Peter, declaring as Peter had done, that the Gentile Christians are not bound to circumcision, nor to the observance of the ceremonial Mosaic Law, but at the same time, he urged the advisability of conforming to certain ceremonies and of respecting certain of the scruples of their Jewish fellow-Christians (Acts 15:13 sqq.). On the same occasion, the "pillars" of the Church, James, Peter, and John "gave to me (Paul) and Barnabas the right hands of fellowship; that we should go unto the Gentiles, and they unto the circumcision" (Galatians 2:9). He publicly commended the great charter of Gentile freedom from the Law, although he still continued the observance in his own life, no longer as a strict duty, but as an ancient, most venerable and national custom, trusting to "be saved by the grace of the Lord Jesus Christ" (Acts 15:11). When afterwards some came from James to Antioch and led Peter into dissimulation (Galatians 2:12), his name was used by them, though he had given them no such commandment to enforce their interpretation of the concordat which, on his proposal, had been adopted at the Council of Jerusalem. When St. Paul after his third missionary journey paid a visit to St. James (A.D. 58), the Bishop of Jerusalem and "the elders" "glorified the Lord" and advised the Apostle to take part in the ceremonies of a Nazarite vow, in order to show how false the charge was that he had spoken of the Law as no longer to be regarded. Paul consented to the advice of James and the elders (Acts 21:1 sqq.). The Epistle of St. James reveals a grave, meek, and calm mind, nourished with the Scriptures of the Old Testament, given to prayer, devoted to the poor, resigned in persecution, the type of a just and apostolic man.